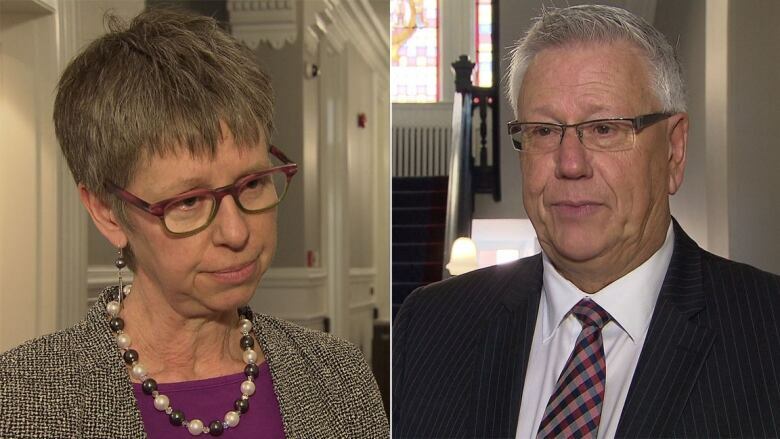 A CBC Nova Scotia investigation has found that of all donations made to the 2012 municipal election campaigns of sitting councillors in the Halifax Regional Municipality, one-third were from companies involved in development. Several city councillors refused donations from companies involved in construction, development and real estate because of concerns over the perception that money could influence — or buy — their votes. A central part of regional council's work is discussing developments, and the city hands out permits. "Let's face it — developers are the people who have the most interest in what municipal councillors are going to decide," said Andrew Sancton, an author and political science professor at the University of Western Ontario. "They have high stakes in the game and they want to support people who favour their position." Halifax regional council is currently awaiting a staff report on tightening rules for campaign finances. At the moment, the city imposes no limits on who can donate, or how much. That's a stark difference from federal and provincial campaign donations, which includes rules that ban companies from donating and also limits individual donations. In the absence of rules in Halifax, some councillors have imposed their own rules. For example, Jennifer Watts said she only accepted contributions from private individuals to a maximum of $500. "I wanted to be supported by people who actually are residents in the district as opposed to receiving money from organizations," said Watts. "I also said I wanted to know every donation that came in and on some occasions made the decision that, 'You know what? That's not a cheque I want to accept' and cheques were returned." 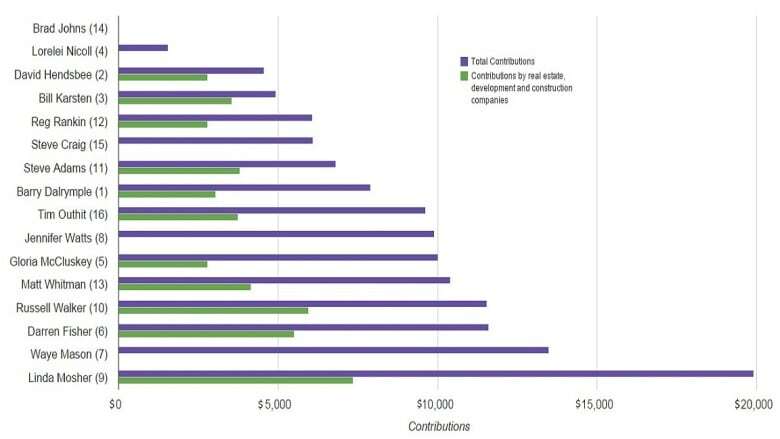 The CBC News investigation analyzed the campaign donation disclosure reports found on the city's website by tallying the totals for winning candidates in each districts and identifying companies involved in construction, development or real estate. This is all available in a searchable database. Barry Dalrymple, District 1 — Total donations: $7,900. From development companies: $3,050. David Hendsbee, District 2 — Total donations: $4,557.85. From development companies: $2,800. Bill Karsten, District 3 — Total donations: $4,925. From development companies: $3,550. Lorelei Nicoll, District 4 — Total donations: $1,550. From development companies: $0. Gloria McCluskey, District 5 — Total donations: $10,000. From development companies: $2,800. Darren Fisher, District 6 — Total donations: $11,600. From development companies: $5,500. Waye Mason, District 7 — Total donations: $13,490. From development companies: $0. Jennifer Watts, District 8 — Total donations: $9,885. From development companies: $0. Linda Mosher, District 9 — Total donations: $19,900. From development companies: $7,350. Russell Walker, District 10 — Total donations: $11,550. From development companies: $5,950. Steve Adams, District 11 — Total donations: $6,800. From development companies: $3,800. Reg Rankin, District 12 — Total donations: $6,075. From development companies: $2,800. Matt Whitman, District 13 — Total donations: $10,393. From development companies: $4,150. Brad Johns, District 14 — Total donations: $0. Steve Craig, District 15 — Total donations: $4,593.48. From development companies: $0. Tim Outhit, District 16 — Total donations: $9,625. From development companies: $3,750. Mike Savage, Mayor — Total donations: $308,805.32. From development companies: $91,500. "I am pro development and will try to find ways to work with the development corporate community and the economic development community to see the city grow," said Coun. Bill Karsten. "That's what I base decisions on — not who gave me money. That goes back to integrity." Mayor Mike Savage raised the most in donations by far, with a total of almost $309,000. Nearly 30 per cent of that — or $91,500 — came from developers, construction and real estate companies. Of all the companies that donated to municipal campaigns in the Halifax area, Armco Capital Inc. gave the most — a total of $16,500 to 12 councillors and the mayor. Several major companies also had top executives give donations as private individuals. Southwest Properties, the company behind the YMCA development, donated a total of $7,000 to three councillors and the mayor. Southwest's chairman and chief executive officer, Jim Spatz, also donated $3,600 to seven different councillors. Spatz declined a request for an interview. Wadih Fares, owner of WM Fares Group, and his wife, Cathy, together donated $3,800 to five councillors and the mayor. "Contribution to an election campaign is part of the freedom, part of democracy," said Fares. "This is the time that you can make sure that you support the candidate that really reflects your views and hopefully that candidate is successful and you make a better city, not for yourself, but for everybody." The Halifax staff report on campaign finance is expected in June.